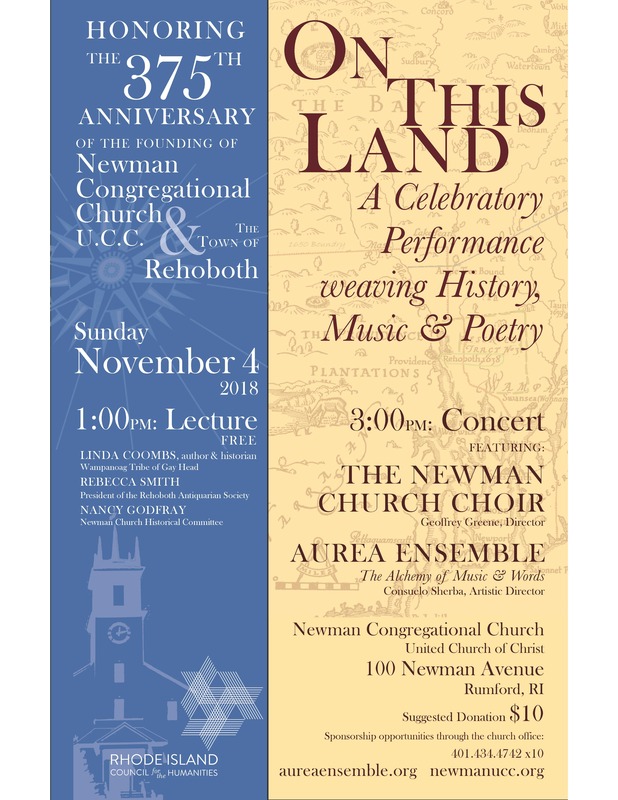 Newman Congregational Church, U.C.C., is pleased to present On This Land: A Celebratory Performance weaving History, Music & Poetry. As part of our year-long celebration of our 375-year anniversary, we will offer a 1 PM lecture in Memorial Hall followed by a 3 PM concert in our historic meetinghouse. The 1 PM lecture will provide historical context, featuring Linda Coombs, author and historian of the Wampanoag Tribe of Gay Head, Rebecca Smith, president of the Rehoboth Antiquarian Society, and Nancy Godfray of the Newman Church Historical Committee. The Newman Church congregation was founded in 1643 when our first minister, Rev. Samuel Newman, secured land from Chief Massasoit of the Wampanoag nation. Although the land was called Seekonk by the Wampanoags, Samuel Newman later called it Rehoboth, a Biblical term meaning open spaces or “God has made room for us.” With this single act, both the church congregation and the town of Rehoboth were formed. The lecture will be presented in Memorial Hall, with original documents and historical artifacts provided by the Rhode Island Historical Society and the Newman Congregational Church Historical Committee. There will be time for questions and answers and light refreshments afterwards. Location: Newman Congregational Church, U.C.C., 100 Newman Avenue, Rumford, RI. The lecture will take place in Memorial Hall; the concert will be in the Meeting House.